CAMP SCHWAB, Okinawa, Japan — The Marines of Ammunition Company, 3rd Materiel Readiness Battalion, 3rd Force Service Support Group, aboard Camp Schwab, were treated to a traditional Eisa Dance, performed by the children of the Asunaro Nursery School, Jan. 15 at the theater on Camp Schwab. According to Cpl. Adam Erskine, records clerk, the dance was the children's way of thanking the Marines for the visit they made to the nursery school in December to spread Christmas cheer. The children were very excited to see the Marines again and showed no reservations about walking right up and interacting with them. "The Marines enjoy spending time with the children. It boosts morale and the kids love it," Erskine said. As the event began, each Marine who visited the school was presented with a certificate of appreciation for their efforts to strengthen the relationship between the Marines and local Okinawans by spending time with the children. Once the Marines were given their certificates, they took their seats and the show was ready to begin. 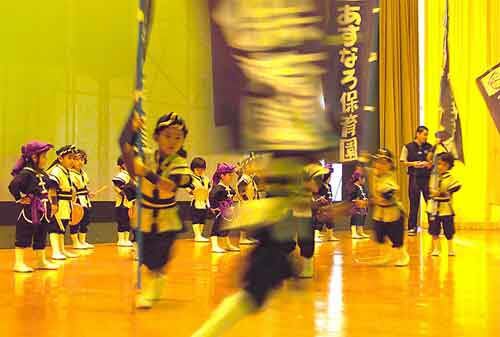 As the music started to play, the children filed onto the stage dressed in traditional Okinawan garb. 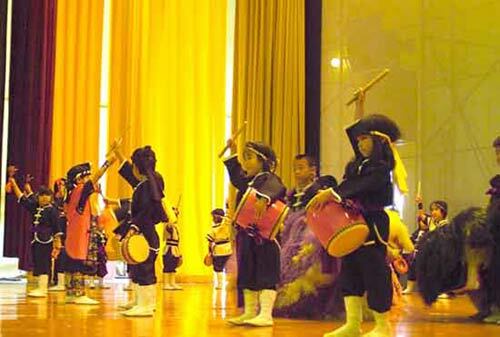 Many were holding tiny, child-size drums or banners, and some held nothing, but participated by dancing. About half-way though the show more children came out dressed in colorful lion costumes. There were two children in each lion suit, working together perfectly to execute each movement. There was even one point in the dance when the child at the head of the costume had to sit on the shoulders of the other child. Once in position, all of the lions stood up at the same time. At the end of the show the children brought the Marines on stage to dance with them. Although the Marines didn't know the traditional dance, they enjoyed the interaction with the children. "I hope this can continue in the future, even after the Marines here leave the island," Erskine said. "Things like this help maintain the bond between the United States Marine Corps and the Okinawans, and that's important." Marines from Ammunition Company, 3rd Materiel Readiness Battalion, 3rd Force Service Support Group, interact with children from the Asunaro Nursery School on stage at the Camp Schwab Theater. 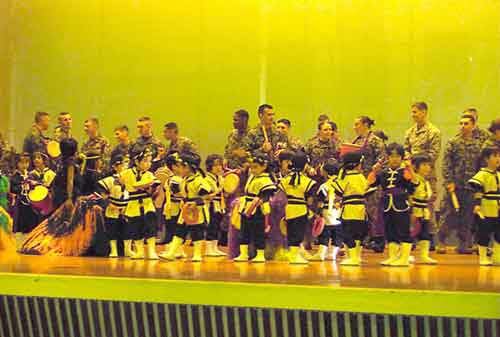 The children were there to perform a traditional Eisa Dance for the Marines on Jan. 15.